An influx of foreigners left the primary school in St Paul’s Bay with no option but to turn to mobile rooms to provide additional classroom space, the college principal admitted. The classrooms, called “prefabricated rooms”, are a type of structure that seeks to provide quick and temporary additional classroom space where there is a shortage of capacity. Speaking to Times of Malta on a site visit to the school, college principal Patrick Decelis said it became clear more space was needed to contain the issue of over-crowding. 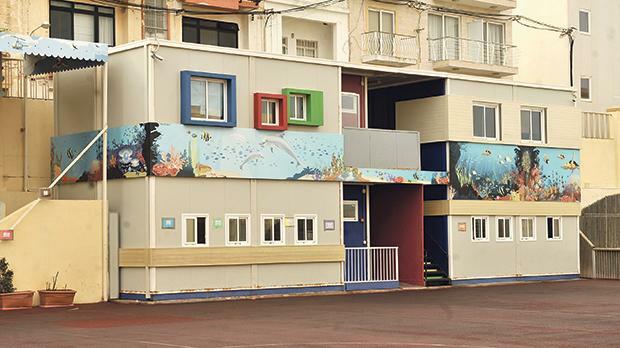 Ten prefabricated classrooms were installed in the playground in order to cope with the demand, he added. Some 15 students stay in each classroom. Students in their fifth and sixth year and in Kinder 1 and 2 also stay in the prefabricated rooms, he said. Mr Decelis insisted he refused to have any more pre-fabricated classrooms installed. Times of Malta reported earlier this week that children in some State schools may have to attend classes in mobile classrooms because of lack of space. Arrangements have been made to install mobile classrooms at St Paul’s Bay primary and Żejtun’s secondary schools as from the next academic year, sources said. Parents who spoke to Times of Malta had mixed reactions to the rooms. One parent said the mobile rooms already installed were comfortable, “although small”, while another said they were too cold. Many, including some who spoke to this newspaper on condition of anonymity, said the need for a new school at St Paul’s Bay had been evident for years, after an influx of people to the locality. “You can’t blame the school because there’s clearly a problem with a lot of students,” one parent said. “From September there needs to be a new school,” she added. Families in St Paul’s Bay and Qawra have been waiting since 2015 for the opening of a new State primary school. The project was meant to address the rapid rise in population in the area, which has exceeded 20,000. A tract of land close to the Qawra church was chosen for the new school by the Foundation for Tomorrow Schools, a State agency responsible for large capital projects falling under the responsibility of the Education Ministry.